When you're in the middle of a fast-paced drill with your team, you don't have time to retrieve the ball every time it goes over the net. 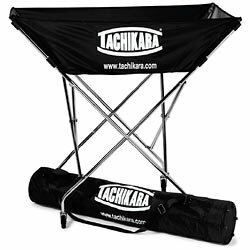 Keep a steady supply of volleyballs on hand with this Tachikara® BC-HAM Volleyball Cart, which holds up to 24 volleyballs, so players and coaches can grab a ball, spike it and start over again without missing a beat. Enhance your team's reaction times and performance with quick drills, so they're ready to take on the competition during important games. When practice is over, you can store the cart easily thanks to the collapsible design and included carry bag.